Just a thought, but any future Larger vessel may be curtailed in size by the fact that the normal drydock used by the Naval service in Cork Dockyard has a graving dock that measures 164.4m x 21.3m x 8.2m. A floating dock with a lift capacity of 2,000 tons is also available. Any vessel intending to use either of the above needs to be smaller than those dimensions. In Practice only smaller vessels such as the peacocks use the floating dock. Those dimensions give loads of capacity for the future! 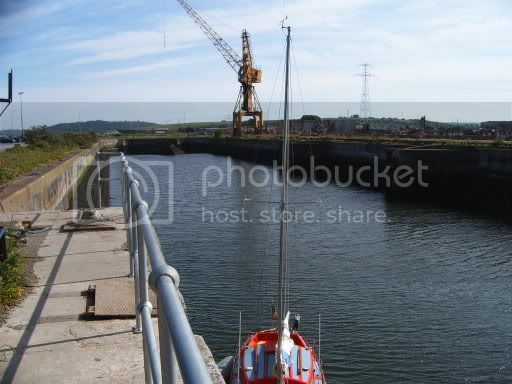 Just a thought, but any future Larger vessel may be curtailed in size by the fact that the normal drydock used by the Naval service in Cork Dockyard has a graving dock that measures 164.4m x 21.3m x 8.2m. Goldie, before you waste valuable bandwith with your reply, he means as a drydock . How big are the Drydocks in Dublin? As an aside, What would it take to get the Graving dock in Haulbowline operational? It is similar in size to that in Cork Dockyard.. BUt I reckon that sometime, somewhere there must be a survey of the damage , if there is not , then that is just more criminal neglect on behalf of sucessive goverments. The drydock in Dublin is over 200M long. We will never have a vessel so long that it would not fit in the graving dock in Rushbrook let alone Dublin, ( Emer is 65.2M LOA ). It would make no sense to spend money on the disused dock in Haulbowline, Dublin and Rushbrooke are underused as it is, besides it would cost millions,new pumps,switch boards, electrical supply, transformers, valves and caissons are needed,the sill would need to be rebuilt as it would no longer provied a watertight seal, besides the capitol cost there would be a cost of tens of thousands just to operate and maintain it. I think there are better ways to spend money like more bertage and crainage,you can never have enough of these! Remember seeing afloating dock for sale somewhere recently...an option perhaps? Pardon my ignorance, but was Cork Dockyard not shut in the early 1990s? Also known as Verolme? Presumably there is something of it left? Verolme Cork Dockyard closed as a shipbuilding facility immediately following the construction there of L.E Eithne. However under different management and ownership, some Engineering and Ship repair work is carried out there. To "Grave" a ship in times of wooden hulls was to insert a new piece of timber,known as a graving piece, in Place of Timber which has rotted in the hull of a wooden vessel. From that we get graving dock, which is a permanent dock with walls usually constructed of stone or concrete and sealed in the normal way with a "caisson". The term originated from the old practice of Graving, or Beaming a ships bottom. Today a Graving dock is synonymous with "dry dock". Now Goldie tell the boys and girls where you got the information from! Wait a while...let them think I have all this stuff in my head. The Information comes from a Fine book, property of one HPT Murphy. The Oxford Companion to Ships and the Sea, which has the answer to all those nautical questions you always wondered about. L.E. Aoife is in Drydock at Rushbrooke at the moment. Interesting to see her out of the water if you haven't seen it before. dublin could never realistically be used unless a naval base is constructed there. If a ship is in drydock there, how do the crew get to work everyday? How would the ship need a crew if it was in drydock? Who do you think does the maintenance work while she is in drydock? Dockyard staff do the engineering bit, but the housekeeping is all Naval. I though it would be all contracted out to the dockyard.